Now has KU leading for both Bolden and Allen. 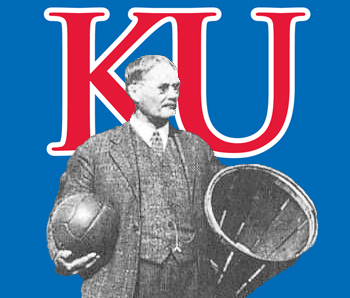 Looks like some Duke and Alabama picks have recently switched to KU for Bolden. 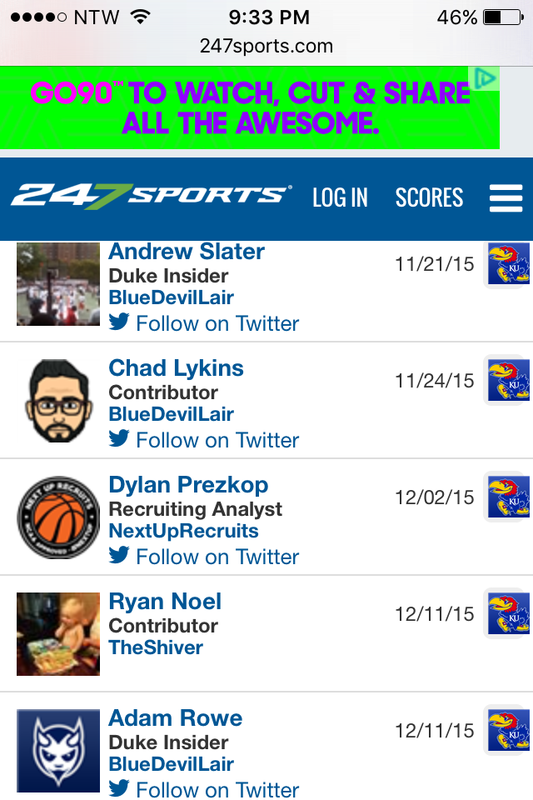 Looks like everyone has been migrating their Allen picks to KU after the recent Kentucky announcements. Allen’s recruitment reminds me a lot of the Wiggins recruitment. Wiggs kept his circle small and kept his decision close to his vest. So the Crystal Ball on him is definitely a crap shoot. Bolden’s may be a little more valid of a reading. I wonder if one or both of them are wanting to make sure Cheick is leaving before they will commit. @jayballer54 Allen and Bolden absolutely would be competing with each other for minutes next year. The 4/5 distinction is irrelevant in Self’s system. The more relevant factor is high post and low post players. Both Allen and Bolden are low post players and would be competing with each other along with Coleby and Lucas for a starting spot if all 3 are at KU next year. Bragg and Lightfoot are the two high post players for Self next year. None of Bragg, Allen, or Bolden are OAD’s at this point so having those 3 would be similar to when KU had the twins and T-Rob manning the post for them. I consulted the magic eight ball and it told me “ask again later”. Updates to come. Exactly, the only credible info with Allen is that he took visits and won’t sign until spring. kentucky is out so it’s the 4 plus maybe another school that tries to get involved late seems how he doesn’t have to official to Texas being in his home town. It’s still a Texas battle for him either Houston or the home school. 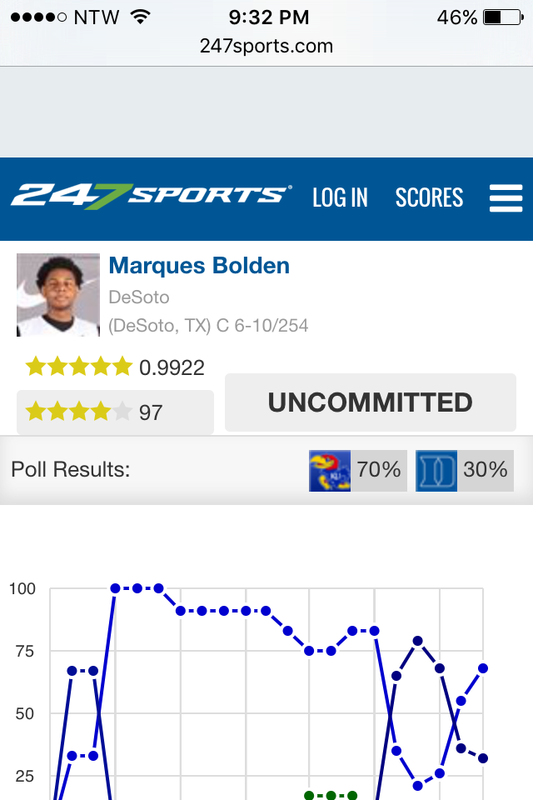 Crystal ball shows we are gaining momentum and trending in the Bolden sweepstakes. Been Three Duke analysts switch their picks to KU in the last few weeks. Historically this is when the crystal ball has been most reliable…big margin, getting close to a possible announcement and lots of late picks getting on board with popular pick. For what is worth we are still leading the Crystal Ball on Allen and have picked up some ground on Josh Jackson too - as @jayballer54 mention earlier. @SoftballDad2011 do you think some of these guys are wondering if diallo stays? Read where Bolden thought he might announce in December. I don’t think anyone knows what Allen is thinking. Last I read on Jackson was that he would be a spring commit. Bolden mentioned the benefit to KU was immediate playing time (departure of Mick, Jam Tray and Perry - at a minimum- will free up minutes). I know Jackson is listed as a shooting guard, but at 6’7" and purportedly having great handles, great passing and a nice shot he could play anywhere from the 1-3…so he may be more worried about Wayne’s plans. Frank D’Tae and Jackson on the perimeter along with Bragg and Bolden down low could be fun! @SoftballDad2011 I bet Wayne is gone. @Crimsonorblue22 if he continues like he has, he sure could be gone. Needs to avoid the roller coaster up and downs he is accustomed to. Even if it means a fresh haircut every game day! Could it be that coach opening up and letting the boys play might be swaying some of these numbers? I would think low post and/or back 2 basket guys like Bolden and Allen would be more interested in Self’s hi lo game. Coach Self’s philosophy has been to win games on D & not on O almost to a point that he seems afraid of good O. This team is totally opposite, its strength is Offense and Pace, and with the quality depth available hopefully Self will change his style this year. I get a feeling that he is starting to see the shift and just hope that he will not revert back to Bad Ball. Yes, it looks like one guy switched his pick from KU to Duke…I believe that he had originally picked Alabama for Bolden before switching to KU a couple of weeks ago. Hopefully it is just an isolated hunch and not inside info.